Nourish and hydrate your dry, damaged hair with Wella�s Lifetex Extra Rich Regime. Its repair complex of nutrients and almond oil penetrate deeply into your hair, restructuring it from the inside, for a head full of healthy hair. Wella Lifetex Extra Rich Shampoo � 250ml Start your regime by gently cleansing your hair with Wella Lifetex Extra Rich Shampoo, providing nourishment that leaves hair incredibly vibrant. 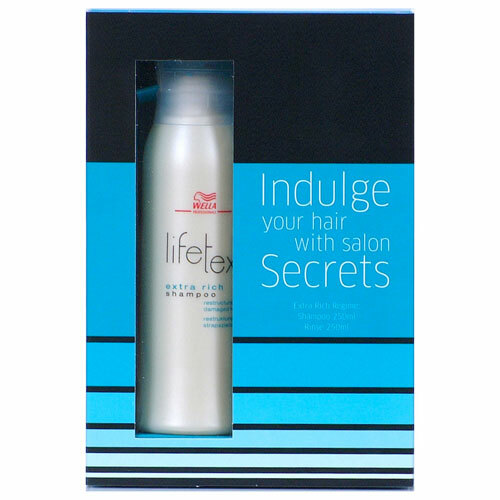 Wella Lifetex Extra Rich Rinse � 250ml Use Wella Lifetex Extra Rich Rinse to provide your hair with the care it deserves. This everyday conditioner continues to repair and restructure your hair, while nourishing it and leaving it easier to comb. Salon Hot Tip - A final cool water rinse after conditioning will close the hairs cuticle and increase shine, therefore helping to keep your hair looking great.